I feel like I am in this in-between space, a sort of limbo. Vanim and I have ended our life here. We moved out of our apartment. I disconnected the utilities. I am a visitor in a friends home. Vanim has started to set things up for us in Sweden. I have a temporary physical address there. I have a Swedish cell phone number. I have a bus pass for the summer. My Swedish life is starting to be arranged and I have not even arrived there yet. Sometimes things in life end suddenly. I have had my fare share of sudden endings. Those kind of endings I am often left shocked and a little angry. They require I deal with them after the fact. Having time to prepare for an ending in life has brought about a different mindset. It has given me the ability to deal with it before hand. My life is coming to an end in America and it feels a little bit like a death. I am beginning to think that perhaps approaching death is in some ways similar. Earlier this week when I was in Idaho visiting my family for the last time before moving to Sweden. While I was there I visited my grandmother’s (father’s mother) grave. She passed away in December and therefore her passing is still fresh on my mind. Perhaps having her death occur right before my move to Sweden has me making this connection between the end of my current life in American and death. Even though I do not know what it will be like to die I believe that there is some kind of life after death. I like this idea that what I am going through now is very similar. That when Death begins to approach I will be preparing myself to end this life and start a different one. I can imagine a place where my honored ancestors and those whom I love who have died are preparing things for my arrival. I look forward to my new life in Sweden. I am move there to be with someone I love and care about very much. That makes it all worth it. 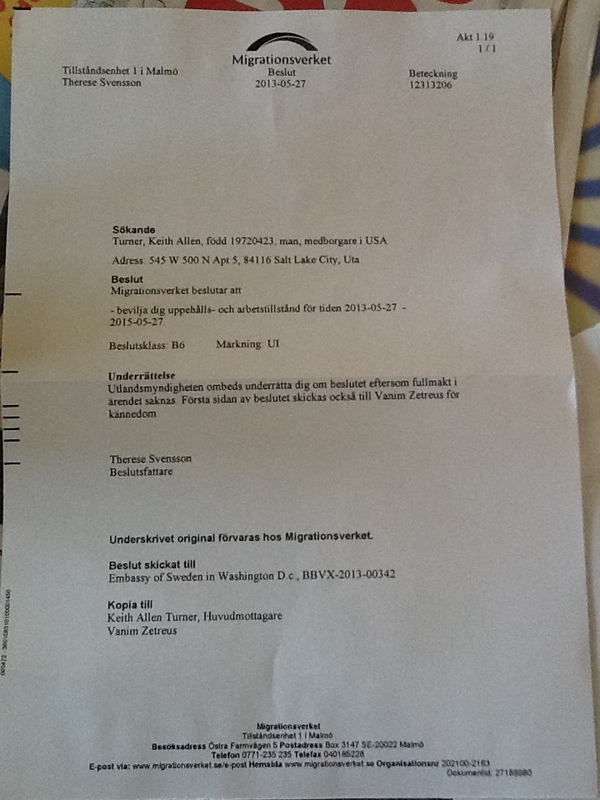 On January 9, 2013 I applied to the Sweden’s Migration Board for a residency permit. On May 27, 2013 my permit was granted. It took four months and nineteen days (139 days) from submission to a decision. If Vanim had tried to get a regular residency permit for the United States, it would have been a completely different scenario. That is making the assumption that the United States government would recognize our relationship which at this time they would not. The United States even has a special visa (K3-K4 non-immigrant visa) for spouses allowing them to enter the United States before their regular visa is approved. Receiving the decision about my residency status in Sweden was the last major hoop to jump through before moving there. Finding out was a great relief, it was like having Christmas in May. Now I will enter a foreign country as a resident instead of a visitor. Being apart from Vanim has not been easy. The world seems a little out of sorts now that he is in Sweden and I am in Utah. I know that the time will go by quickly in retrospect, but I am not looking back. I am looking forward and the days look just long at the moment. My despondency over our separation are most pronounced at night just before bed and in the morning after waking up. Technology has made it possible for us to communicate with each other regularly. It is nice that we can talk on the phone, text and email and all for very little cost or free. It helps us stay connected but it is just not the same thing as being together. I miss little things in our communication that technology cannot replace. There is no holding his hand while going for a walk. A virtual hung does nothing to confort me. I cannot snuggle next to him while watching a movie. I sleep alone, except for the occasional visit from our cats Seth and Maggie. I miss the little things, his facial expresions, the small touches, having my hand being held, the hugs. There is a saying that absence makes the heart grew fonder. My heart has enough fondness for Vanim. I don’t want to grow any more fondness. I am ready for the seperation to end. Today I boarded the FrontRunner train during rush hour. The train is full of people and there was few empty seats. In the middle of the train there was three empty seats. A man was sitting in one slouched down in his seat with his legs extended blocking all entry to the other seats. When I approached the seat on the other side of him he gave me this look to warn me away. I looked at him said excuse me and pushed my way through to one of the seats on the other side of me. This prompted another guy to sit next to me right across from him. Periodical until I reached my stop the seat blocking guy would look at me and glare. Incidents like this seem to be common in my experience. I have often occupied an empty seat and the person in the next seat feels that I have encroached upon his space. He will keeping his elbow partly in the way hoping I will not fully occupy the seat or keeps his legs partly occupying the space where my legs should go if am sitting in the middle of the seat. Nothing seems to upset a man more than when you sit in the center of your seat causing your legs to be nested next to his or your arms and hands to practically be entwined. Generally after about a minute or two they will move firmly into the center of their seat and cut off all physical contact. Then they will make a loud sigh of some sort to signal to me that I have violated their personal space. This problem I generally only encountered with men. If I sit next to a woman she will remove herself and any personal belongings from the area of the seat I am occupying. Also this usually only happens if I sit next to someone who is defiantly a white collar worker. Generally they are wearing at least nice slacks, a dress shirt and usually a tie. Being that the FrontRunner caters mostly to white collar workers it is more pronounced there then when I ride Trax or the buses. I interpretation as them feeling a sense of entitlement to conquer the area the occupy and any surrounding area if they can. Their strategy relies on any woman being submissive and on any man being creeped out by physical contact from another man. I have no fear of male contact and therefore after a minute or two of physical contact I win most of the time. It is certainly amazing that some people after choose to ride public transportation continue to act as if they are in their own personal place. Public transportation by its very nature is where the community mingles together in close proximity. Touching someone else is often inevitable. One of the things I enjoy about using public transportation is the shear variety of people you cross paths with. When I drove my car everywhere I often avoided having to deal with people that were not part of my social group and therefore felt more isolated from the greater community. I feel a better connection to the greater community I live in since I started riding public transportation. I look forward to experience public transportation in Sweden. The three most important people in my life are Vanim, Mary, and Bradley. All three have an equal spot at the top of my most important list. When Vanim and I decided to build a life together Mary and Bradley were very much a part of that decision. Often we are left to make complicated decision based upon what we feel will be the best choice with limited information. Such was the case when I decided to move to Sweden. “What about your kids?” or “Keith’s abandoning his kids” are just some of the comments that I have heard in the last few months since I started telling people that I was moving to Sweden. Some people have even hinted or outright said that I am running away from life with a tinge of jealousy. My Son Bradley said to me “Dad, you would never abandon us, that does not sound like you” when I asked him if he felt like I was abandoning him. Vanim’s very limited health insurance ended in January of this year. To be uninsured with health issues makes for a very difficult situation. The current climate being what it is in the United States and in the State of Utah made it impossible for either of us to get him health insurance. Though things appear to be shifting here in the United States. On top of that Vanim had to leave the United States by the end of May or be in violation of his visa and thereby becoming an illegal immigrant. Just the very thought of both of those scenarios was very troubling. My kids need me, I am an important part of their lives. For the last nine months we have been practicing what it is like to maintain a long distance relationship, as their mother moved 200 miles away from where they use to live to take a job. Some moments in this new long distance relationship have been more successful than others. I realize that having 250 miles between us is far different then having 5,000 miles between us. Though experiences of maintaining a relationship with my kids from a distance is a reference point from which to navigate a relationship with them while living even further apart. One thing that I have learned is never underestimate a child’s capacity to understand the complicated situations in the world around them if only I take time to communicate with then and listen to them. Mary and Bradley were the fist to know of my decision and even that was not a surprise because we had talked about the possibility even before it became a reality. I do have moments when I wish I could run away from life. My experience teaches me that life follows you where ever you go. My life will certainly be different in Sweden. I have no way of knowing how things will turn out. I have no way of knowing how it will affect my kids. What I do know is that I am hopeful, hopeful for a bright future with Vanim, Mary, and Bradley. Sometimes in life all we really have is hope. It is that hope that gives us courage to navigate though the complexities that life gives us. I left my keys on the stove and walked away for good. It is now official. I no longer have any attachments to the apartment in the Guadalupe neighborhood in Salt Lake City. With a great amount of relief I have very little left in the way of things. I still have some things to go through and a few things to pass on to friends. I have decided it is much harder to move when we are having to get rid of most of things we own. I have risen to the challenge and survived. In 2006 I moved into an apartment in downtown salt lake city. I moved in with a suitcase with some clothes, a pillow and a blanket. That was all I owned at the time. A year later I moved out with an apartment full of furniture off of it given to me by others. Sunday I passed on the blessing to a friend’s daughter who moved into her own place for the first time. I passed on to her most of my furniture. It felt good to be able to help someone else and at the same time to let go of the things in my life that I needed to let go of. As the dust is settling a sense of peace and a new sense of freedom is starting to fill me. There is something to be said for not having a lot of things that take up my time and energy. In the future I want to be discriminating about what I decide to own. I feel victorious in decluttering my life. Now going forward into the future I want to keep my life free from unwanted items and fill it with people and important things. Goodbye my love. The next five weeks look like an eternity from this side but will be just a moment from the other side. I will miss you when you are gone. As I close down life here you will be starting life there for us. I send you on your way with lots of hugs and lots of love. See you in Sweden in five weeks. Fifteen years ago today I welcomed my daughter Mary into the world. She has been a bright light in my life since then. As I am downsizing to very few possesions I have been reflecting on the things in life that are important to me. My two children are on the top of that list of what is important in my life. It is people and our relationship with them that really matter. “Sometimes when things are falling apart they may actually be falling into place”. This is what greeted me on Facebook this morning when I checked my news feed. A picture meme shared by a friend. The last few days have been filled with my plans falling apart. Once of my great joys in my life of the last three years has been to be a bee keeper. I have become fascinated by these little insects. Finding them a new bee keeper was important to me. My aunt who has wanted to be a bee keeper for a few years now was chosen by me to be their new bee keeper. Plans were made to bring the hive down to Idaho along with my car. Early in the morning I covered the exit points with mesh wire so that the bees could not get out preparing the hive for transport to a new location. I did not secure it will enough and the bees were able to escape. By mid afternoon when I was ready to retrieve the hive it was covered in very angry bees who could not get back into their hive. No sooner did I approach the hive then hundreds of bees flew at me to let me know they were angry. Even with a bee suit on they even managed to find a place to sting me through my socks on my ankles. I had no choice but to pull off the wire mess and leave the hive where it was at. As everything has fallen into place I will have another opportunity to bring the hive up to Idaho. I was able to spend time with my father and step-mother last night and to spend time with my mother and step-father this morning. This time would have been spend with the hive and instructing my aunt about the bees instead. I will also have time to do spring maintenance of the hive which I had been unable to do. It is not unusually for plans to fall apart but as I am preparing to move to another country I have a lot of moving parts and limited time to get everything done I need to. When something does not work as planned it becomes easy for me to feel overwhelmed. And yet sometimes the falling apart is really just a falling into place. I gave my father my car and today he picked it up. Now it would be nice to just be able to say that and be done with it. I gave something away and that was that. But it is not that simple and it may never be simple for me. I am attached to my stuff. There was the normal emotional moment of OMG what have I just done. If I was not moving and forced to decutter my life I might have stopped by now in the declutter department. I wont bore you with all the detail but it was not easy to get the car on the trailer he was going to haul it home on. Nothing worked out the way I had planned, which only added to my feelings of despondency. I returned with him to Idaho Falls spending four hours in the car some of it talking. We talked over dinner and after dinner. I was once again reminded of what is important to me. I spent time with my father.